The Scan Man is a long time supporter or Kodak’s Document Imaging Division, as both a user and a certified reseller. It is a very sad story, but one that does not necessarily have a bad ending. You can read the gory details below, however it is my belief that the people and products that are part of the document scanning unit will continue on and grow. I have spoken with a number of people in Rochester off the record. The document imaging unit produces outstanding scanners and software and was a bright spot in an otherwise dark place. There is widespread belief that the document imaging products will live on with Kodak as a restructured entity or as an acquired entity within another manufacturer. The Scan Man predicts a strong future ahead for the document imaging division once the current situation is resolved. From Reuters: Eastman Kodak Co, which invented the hand-held camera and helped bring the world the first pictures from the moon, has filed for bankruptcy protection, capping a prolonged plunge for one of America’s best-known companies. The more than 130-year-old photographic film pioneer, which had tried to restructure to become a seller of consumer products like cameras, said it had also obtained a $950 million, 18-month credit facility from Citigroup to keep it going. The loan and bankruptcy protection from U.S. trade creditors may give Kodak the time it needs to find buyers for some of its 1,100 digital patents, the key to its remaining value, and to reshape its business while continuing to pay its 17,000 workers. “The board of directors and the entire senior management team unanimously believe that this is a necessary step and the right thing to do for the future of Kodak,” Chairman and Chief Executive Antonio Perez said in a statement. “Now we must complete the transformation by further addressing our cost structure and effectively monetizing non-core intellectual-property assets. We look forward to working with our stakeholders to emerge a lean, world-class, digital imaging and materials science company,” he added. At end September, the group had total assets of $5.1 billion and liabilities of $6.75 billion. Kodak said it and its U.S. subsidiaries had filed for Chapter 11 business reorganization in the U.S. Bankruptcy Court for the Southern District of New York. Non-U.S. subsidiaries were not covered by the filing and would continue to honor all obligations to their suppliers, it added. Kodak once dominated its industry and its film was the subject of a popular Paul Simon song, but it failed to embrace more modern technologies quickly enough, such as the digital camera — ironically, a product it even invented. Its downfall hit its Rust Belt hometown of Rochester, New York, with employment there falling to about 7,000 from more than 60,000 in Kodak’s heyday. Its market value has sunk to below $150 million from $31 billion 15 years ago. In recent years, Chief Executive Perez has steered Kodak’s focus more toward consumer and commercial printers. But that failed to restore annual profitability, something Kodak has not seen since 2007, or arrest a cash drain that has made it difficult for Kodak to meet its substantial pension and other benefits obligations to its workers and retirees. Perez said bankruptcy protection would enable Kodak to continue to work to maximize the value of its technology assets, such as digital-imaging patents it says are used in virtually every modern digital camera, smartphone and tablet. The company has also built up patented printing technology. 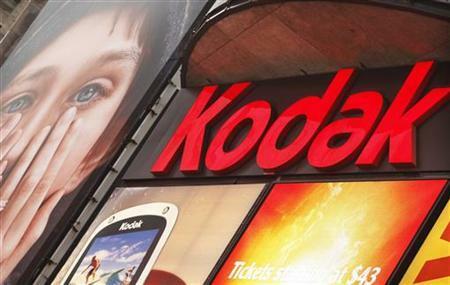 Kodak said it was being advised by investment bank Lazard Ltd, which has been helping Kodak look for a buyer for its digital patents. Other advisers included business-turnaround specialist FTI Consulting Inc, whose vice chairman, Dominic DiNapoli, would serve as chief restructuring officer for Kodak, supporting existing management. In the last few years, Kodak has used extensive litigation with rivals such as Apple Inc, BlackBerry maker Research in Motion Ltd and Taiwan’s HTC Corp over those patents as a means to try to generate revenue. Those patents may now be sold through the bankruptcy process. George Eastman, a high school dropout from upstate New York, founded Kodak in 1880, and began to make photographic plates. To get his business going, he splurged on a second-hand engine for $125. Within eight years, the Kodak name had been trademarked, and the company had introduced the hand-held camera as well as roll-up film, where it became the dominant producer. Eastman also introduced the “Wage Dividend” in which the company would pay bonuses to employees based on results. Nearly a century after Kodak’s founding, the astronaut Neil Armstrong used a Kodak camera the size of a shoebox to take pictures as he became in 1969 the first man to walk on the moon. Those pictures arguably had more viewers than the 80 films that have won Best Picture Oscars and were shot on Kodak film. Six years after Armstrong’s walk, and not long after Simon told his mama not to take his Kodachrome away, Kodak invented the digital camera. The size of a toaster, it was too big for the pockets of amateur photographers, whose pockets now are stuffed with digital offerings from the likes of Canon, Casio and Nikon. But rather than develop the digital camera, Kodak put it on the back-burner and spent years watching rivals take market share that it would never reclaim. In 1994, Kodak spun off a chemicals business, Eastman Chemical Co, which proved to be more successful. Kodak’s final downfall in the eyes of investors began in September when it unexpectedly withdrew $160 million from a credit line, raising worries of a cash shortage. It ended September with $862 million of cash. In its bankruptcy, Kodak could try to restructure its debts, or perhaps sell all or some of its assets, including the patent portfolio and various businesses. It is unclear how Kodak will address its pension obligations, many of which were built up decades ago when U.S. manufacturers offered more generous retirement and medical benefits than they do now. Many retirees hail from Britain where Kodak has been manufacturing since 1891. The company had promised to inject $800 million over the next decade into its UK pension fund. It now remains unclear how that country’s pension regulator might seek to preserve some or all of the company’s obligations to British pensioners.